Lighter and more compact than the standard Dynafit crampon, the Speed is built for just that. The crampons have mean looking teeth and more cutouts to save weight. They are shallower in bite so work best with lower riser settings, like those found on race bindings. The Speed Crampon is 78mm wide and weighs 63 grams. It takes up less space than a standard crampon so is great for race packs. Simply slide the crampon into the side your compatible toe piece and let it drop on your ski for extra security when skinning on hard snow. 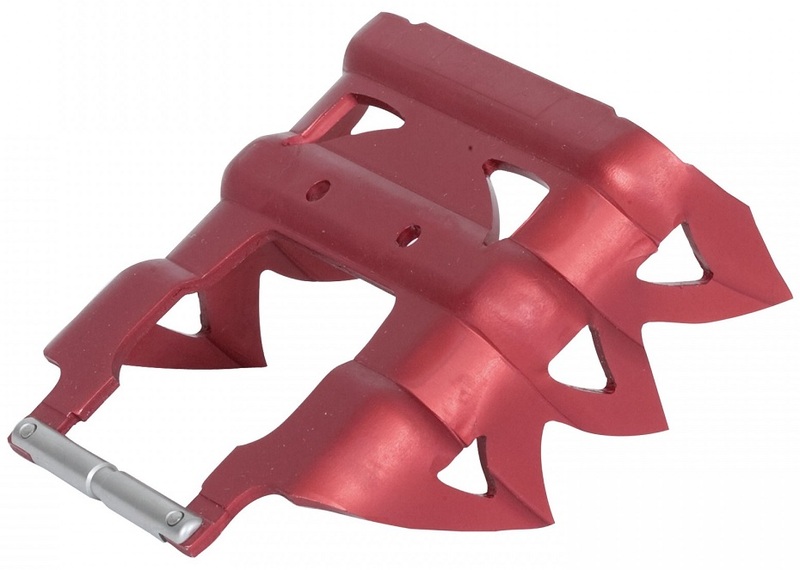 Tony- Dynafit ski crampons should work with ATK bindings. If yours is not then I would say the receptor is not quite wide enough like you thought. A little persuasion might be needed. Hey Heidi! Nope! In the description it says they're only 78mm wide. The 90mm version of this might work though. Might be worth erring on the side of 100mm just to be safe though. Which crampon do you recommend for Hagan Cirus (75 waist) and Hagan x-race skis with Hagan (ATK) race bindings? Will this speed crampon (78mm wide) work okay for both, or should I consider the regular dynafit crampon (80mm wide)? Hi Ram, the Speed Crampon fits either of those skis. It has a more shallow bite, so it's better if you use race bindings or lower riser settings. First year for this model's distribution in North America, but I’ve been using these for many years ever since they were first introduced in Europe. The picture doesn’t make them look that much more compact than the standard models, but in reality they are indeed noticeably more compact in your pack. Yet with the teeth configuration, and a low standheight toe unit combined with a “half-step” heel elevator position (i.e., as on any race or near-race binding), their bite is fine. Just one caveat: for that perfect bite I added some spacers (from an older Dynafit Speed heelpost add-on kit, same as the newer Speed Turn). As shown in my picture above, the red spacers (and hope that you appreciate my color coordination!) are what Jason calls the "TLT Speed Nubbin" in the binding parts listing. You'll need four total, but you don't need the original attachment hardware. Instead just visit the hardware stores bins for T-Nuts with Brad hole 6-32 x 1 ¼ plus corresponding machine screws. Depending on the tolerances, you might need to just barely "kiss" the preexisting holes in the crampons -- but this is like a two-second minor drilling, nothing serious. which crampon goes with the dynafit speed turn binding? Hi Ute, all Dynafit crampons will work with all Dynafit bindings. Pick the size based on the width of your ski. For more options, see here.